Taught at a young age to always do her best, Alicia Garcia Clark has built an impressive resume over the years. She was the first woman to study textile engineering and the only woman to work at Celanese, and experienced continuous promotion throughout her journey. She started with Celanese Mexicana, a subsidiary of the Celanese Corporation, as a chemist in 1951, and became a laboratory manager in 1953. When the company decided to start a long campaign to improve their product, they took her from the laboratory and made her a technical assistant in the Sales Promotion Department. Ms. Clark was successful in selling new ideas to the mills because they believed she was genuine in wanting to help them. She eventually became known as the face of Celanese because everyone appreciated her work so much. Subsequent roles with the company include sales promotion manager, and sales promotion and advertising manager. When Ms. Clark wasn’t working, she was very engaged in civic activities. 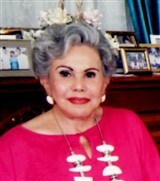 She was the president of the San Marino Guild Huntington Memorial Hospital and of the San Marino Woman’s Club, and the chair of the Libertarian Party, as well as the president of the board of directors of the Opera League of Los Angeles and the founder and co-chair of Hispanics for Los Angeles Opera. Additionally, she was the chairman of Celebrity Series, the treasurer of Fashion Group, and a member of the Mexico Olympic Committee. When her husband, Ed Clark, campaigned for political office, she spent three months traveling to more than 10 states to present his ideas to the media, colleges, clubs, and unions. Today, Ms. Clark maintains roles as a member of the board of advisers of the Pasadena Symphony Orchestra and POPS and the managing director and life trustee of the Los Angeles Opera. ​As a testament to her success, Ms. Clark received a Star for the Arts Award and a Philanthropic Leadership Award from the Los Angeles Music and Art School and a medal from the Pro Conscious World Association in Mexico in 2011. She was also honored with a Zachary Society Honor Award in 2001, a Plácido Domingo Award in 2000, a Heroes Los Angeles Award from the Hispanic Traditions and Heritage Council in 1995, a Star of Our Culture Award from the Mexican Cultural Institute, and an award from the Fashion Group in 1970. Her achievements were highlighted in numerous editions of Who’s Who in America, Who’s Who in the World, Who’s Who of American Women, Who’s Who in American Politics, Who’s Who in Finance and Business, and Who’s Who in Finance and Industry. Ms. Clark prepared for her career by earning a Master of Science in chemical engineering from Universidad Nacional Autónoma de México. She is fluent in English and Spanish and knows both French and Italian.